When the Metro board approved fare hikes last May, it also directed Metro to engage experts from the American Public Transportation Association (APTA) to study Metro’s fares and look into other revenue strategies. APTA experts completed their review recently, and presented their findings at last week’s Metro board meeting. Though the APTA review recommended approving Metro’s proposed fare increases, many of their findings contrast somewhat with present Metro policies. The review sheds light on many Metro revenue practices, from fares to parking, and what their implications are regarding serving low-income riders. More details are available at the full review [PDF]; Metro’s summary [PDF], audio from last week’s board discussion (item 56 here), and The Source. The review also supported raising Metro’s student fare, which is currently frozen. APTA recommends that Metro partner with colleges and others to help offset the costs of student discounts. During the board discussion, though not explicitly mentioned in the review, one panelist suggested Metro consider adopting one practice used by other transit agencies: offering a discount fare for youth (such as up to age 18) that is not necessarily dependent on student status. The review recommended consolidation of all of Metro’s discounts – senior, student/youth, and low-income – into a single discounted fare product. Means-testing for this (deciding who qualifies for discounts) could be done in conjunction with other governmental programs, such as school free lunch programs and/or utility discounts, thereby lessening administrative burdens for Metro and its patrons. The review recommended trip-based discounts over time-based discounts. Low income riders are better served by, for example, a ten-trip pass than a weekly or monthly unlimited pass. Citing a New York study, the APTA panel noted that thirty-day passes tend to benefit higher-income riders. For example, even transit-dependent riders sometimes get rides in a car, possibly at times when Metro service is lacking. With trip-based discounts, these non-Metro trips save a Metro fare, and hence wouldn’t effectively count against a time-based unlimited pass. The review also recommended that Metro adopt distance-based fares. Generally, a single fare for all trips regardless of distance tends to benefit higher income riders, who, on average, tend to take longer transit trips than lower income riders. Having to pay more for longer trips thus can remedy inequities currently experienced where, to an extent, lower income riders are subsidizing higher income riders. Metro CEO Art Leahy noted that Metro’s average bus trip is three miles long, while its average rail trip is twelve miles – and that this disparity is expected to become greater with the opening of the Regional Connector, which will make longer no-transfer rail rides even easier. Historically this has been difficult to administer, but, especially with all rail/BRT trips requiring electronic fare via TAP card, distance-based fares on Metro rail appear to be feasible and fair. Overall, the review cautioned against too much focus on discounted fares. With 80 to 85 percent of Metro riders classified as low income, discounting one group of riders on the back of another means having low-income riders subsidize those who have only a slightly higher income. The APTA review recommended “more frequent service on a more sparse network, with wider stop spacing.” This would likely include decreasing service on low-demand lines and moving those resources to increase frequency on high-demand routes. Leahy echoed this recommendation, recalling that Metro had tried to address overcrowding on Vermont Avenue buses by adding more buses, only to find that overcrowding continued because Metro riders were willing to walk further to take advantage of the increased frequency of service on Vermont Avenue. The review also called for a greater load factor (more crowded buses), fewer bus stops, and eliminating service that overlaps with municipal operators. Auditors were clear that parking costs are context sensitive. There is no need for Metro to try to stick to a one-size-fits-all strategy, but parking should be priced at different amounts at different locations at different times of the day. The panel recommended that Metro consider outsourcing parking management to private parking companies with experience in optimizing usage and revenue. Boardmember and Los Angeles City Councilmember Paul Krekorian questioned the APTA experts about how to strike the proper balance regarding parking at San Fernando Valley rail stations, including North Hollywood. APTA panel member Michael Connelley, of the Chicago Transit Authority, responded that easy parking encourages driving that first/last mile, and that it would be better to re-direct parking resources to instead fund convenient, frequent bus service. He also recommended that stations would be better served in the long run if parking were replaced by mini-village transit-oriented development. APTA panel member Brian D. Taylor, of UCLA, further responded that park-and-ride subsidizes higher income riders, decreases transit’s air quality benefits, and that charging would help the agency’s bottom line, with revenues available even to build more parking if the demand indicates. Additional recommendations for revenue were fairly limited, and none was as relevant as fares or parking. However, one suggestion for raising additional revenue was to rent station space for automated dispensing machines, such as ATMs, at transit stations. This was a fantastic summary. And now I cannot wait to read the whole thing. Really. Thank you, Joe. I agree that Metro should charge for its car parking, even if those charges are minimal in some cases. Free parking is literally subsidizing the competition. At the end of the day building complete neighborhoods that are dense and affordable enough to support convenient transit service should be the goal of development around stations. But not one word on increasing bike/ped access to stops to offset the loss of service on under-performing routes? Or is my being too lazy to read really showing here? Amen to the parking recommendations. And as a persnickety correction, I believe the photo is of the Culver City station parking lot, not the La Cienega lot as mentioned in the caption. Yeah,I’m surprised there is no mentions of bike share as a way to address that first/last mile problem. It seems to be working very well in other cities that have implemented it like DC and NYC. Well, at least in Art Leahy’s Vermont Avenue anecdote – in cases where where there is a street grid, people will walk further to get to better, more frequent service. It’s slightly Rashomon – the summary, the report (fairly short), and the presentation at the Metro board were all a little different from each other. I think there are a lot of good recommendations that will likely move forward at Metro in the near future: distance-based fares (likely for rail, not bus), incrementally charging more for parking where warranted (already we’re seeing tiptoes in the right direction on this), and consolidation of lines and stops. It’s good to hear that APTA recommends increased stop spacing, I think it should take the form of increased Rapid service and retooling the Local lines to focus more on bringing passengers to/from the Rapid stops and rail/busway stations, rather than just running parallel to Rapid lines. *Note to Metro marketing team: Tagline may need some work. Metro has tried to thin the route network for years. Routes like the 168, 225, 26, 107, and 11 have been victims of the route thinning movement. People living on lines like the 209, 18 and 51 west of Downtown, 175, 119, 126, and 156 need to start using their lines, or else they will get cut. 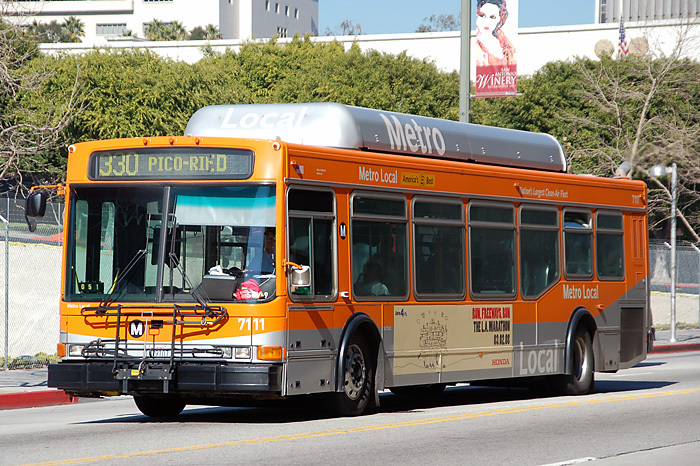 Rapid bus, with bus only lanes, are going to be what really transforms Los Angeles. I really hope distance based fares never happen. The nation’s most used system doesn’t use them so why should LA? Limiting people’s recreational, job, and educational choices to what is closest to them if they can’t afford higher fares to go across town is not inclusive and hurt’s low-income people no matter what studies show. I’m ok with raising fares slowly over time, but keep them flat rate! I agree, you would think they would suggest something that would leverage the impending bike share system, like create comprehensive payment program or link to tap card to encourage transit usage. Remember when people said LA will always be on the honor system? Eventually, things change. You can’t keep raising fares forever. You keep raising flat rate fares, the poor who have to use the bus over shorter distances like even going to go buy groceries get hurt more. $2.00 fares tomorrow, $3.00 fares, then $5.00? Will you pay $5.00 just to go to the neighborhood grocery store? “hurts low-income people no matter what studies show.” groan. The flat rate fares means that lower income people are effectively subsidizing people with higher incomes. Should Metro Adopt Distance-Based Fares? Editorial: Why Raise Metro Fares While Giving Away Metro Parking?